Seeing the birth of a newborn kitten is quiet exciting. They grow so fast from this tiny little feline that can fit into the palm of your hands,to this big cat laying next to you purring happily as you pet him/ner. Although your kitten's mother will do most of the work, as mothers always do, you will want to know what to expect as your feline grows and develops. Here we have broken down the first twelve weeks of your kitten's life. A newborn kitten is born both blind and deaf. Their eyes are shut and their little ears folded over. Although they can smell, this sense is very weak at this point. Like human babies they spend most of their time, sleeping, crying and eating. 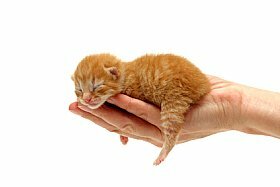 Your newborn kitten is very sensitive to cold and either needs his/her mother for warmth, or warm blankets, if your playing the role of surrograte parent. At this stage the newborns umbilical cord is still attached to their stomach. At this stage your cat's ears will open and their hearing improves. They began to try to walk and as their senses improve they will slowly start exploring a bit. Litter box training can begin at this stage, but your cat will require lots of supervision meanwhile in the box and may have some accidents outside of the box. An open litter box is recommened when trying to train a kitten, because it's less intimidating than a closed box and is easy for you to keep an eye on your kitten.To find out about the different types of litter boxes, read Cat Litter Box:Which One Will Your Cat Actually Use. 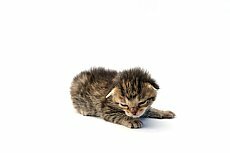 Your kitten will continue to gain weight a bit faster at this point and will start grooming his/her self by the end of four weeks. At the end of four weeks kittens start to play , so it's time to buy some safe cat toys, the ones that do not have long strings, cats can easily get tangled up. The mother will start to wean off her kittens.So your cat can start to eat high quality premium kitten food in a shallow bowl. 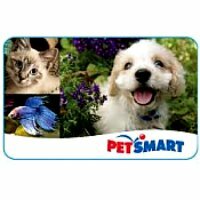 To find out more on how to choose the right cat food for your kitten, Kitten Food:A Healthy Start For Your Cat. Kittens are extremely energetic and playful at this point and will run and jump on everything and everyone. Set aside play time to engage in play sessions with your new bundle of energy. Your cats nails will be very sharp, so it's time to introduce a scratching post, and begin to discourage your kitten from using your couch as one. Your cat will get his/her first set of vaccines at seven weeks,to find out which vaccines your cat needs and which ones they don't, Cat Vaccines: A Breakdown Of Which Ones Your Cat Needs. By the end of eight weeks your cat is completely weaned off of their mother and can eat more wet or dry food. Your cat will now almost have a full set of sharp teeth. This is a important time to start having more petting and play sessions with your kitten, so he/she become used to human contact. 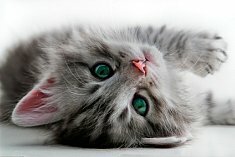 Your newborn kitten's eye colour will be settling into their permanent colour. It ia time for your cat's second set of vaccines.Your cat's nails will grow very long and sharp, so it's time to start nail clipping. It's also a good time to start grooming by brushing your cat's fur and teeth,so that he/she gets used to it. Your newborn kitten is now fully weaned,cat litter box trained, has well developed senses and quite independent. A cat is considered a kitten until the age of two, these years go fast,so enjoy your kitten years as your kitten grows into a beautiful healthy cat. 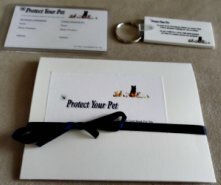 Bringing Home A New Kitten -Important Tips To Help Prepare You And Keep Your Kitten Safe. How To Choose The Healthiest Dry Cat Food- A List Of Important Factors To Keep In Mind When Buying Your Next Bag Of Cat Food.